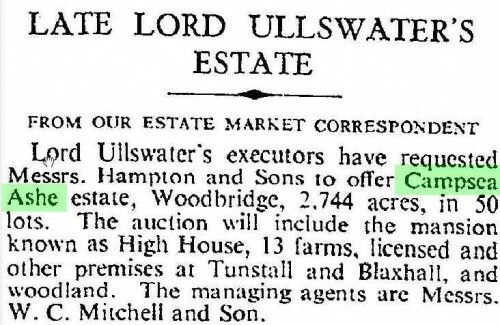 The Estate totalled 2,717 acres in Campsea Ashe, Blaxhall and Tunstall as well as pockets of land in places such as Farnham and Snape. The auction was held at The Crown & Anchor Hotel, Ipswich on Wednesday 9th November 1949 and the jopint auctioneers were Hampton & Sons and W C Mitchell & Son. The auction catalogue can be downloaded here (large 66mb pdf file will take time to download).